What Groove Triggers and Actions are Supported? Agent Replied - Triggers when an agent replies to a ticket. Ticket State Changed - Triggers when a ticket's state is changed. Ticket Closed - Triggers when a ticket is closed. Ticket Opened - Triggers when a ticket is opened. Ticket Moved - Triggers when a ticket is moved to a different mailbox. Customer Added - Triggers when a customer is created. Ticket Deleted - Triggers when a ticket is deleted. Agent Invited - Triggers when an agent is created. Note Added - Triggers when a note is added to a ticket. Customer Replied - Triggers when a customer replies to a ticket. Ticket Started - Triggers when a new ticket is created. Ticket Tagged - Triggers when a ticket is tagged. Ticket Priority Changed - Triggers when a ticket's priority is changed. Ticket Assigned - Triggers when a ticket is assigned. Reopen Ticket - Changes the state of a ticket to "opened". Change Assigned Agent - Assigns an agent to a ticket. Close Ticket - Changes the state of a ticket to "closed". Add Note - Adds a private note to an existing ticket. Create New Ticket - Starts a new ticket for your customer. Change Ticket State - Changes the state of a ticket, e.g. from "opened" to "closed". 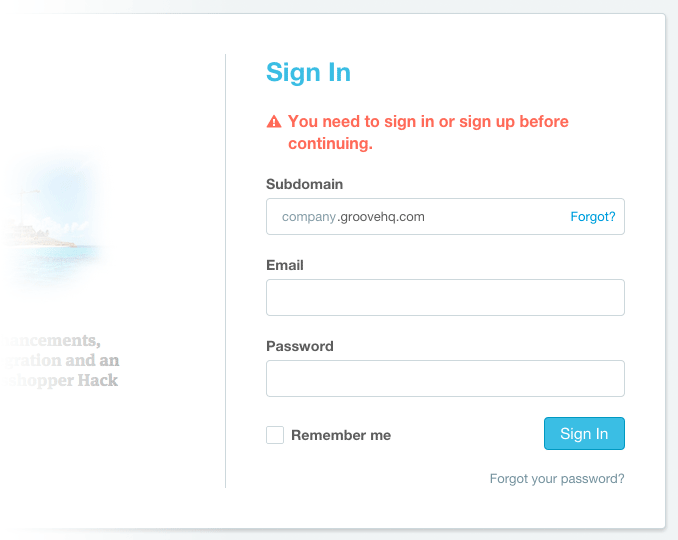 You’ll get a popup prompting you to sign in to your Groove account. If you don’t yet have an account, sign up for free here. 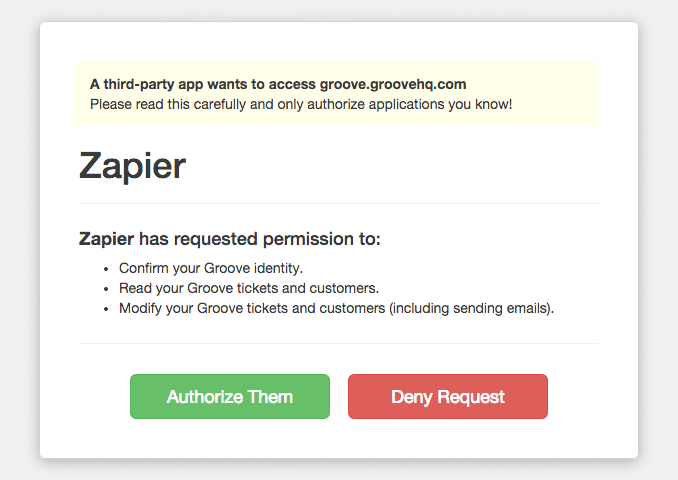 When the authorization box appears, click Authorize Them (this is to let Zapier link your Groove account to the other apps you choose). Connected Groove account should now appear in your Zapier Connected Accounts page.